While writing my previous post, I was reminded of something called ‘the trust equation’. 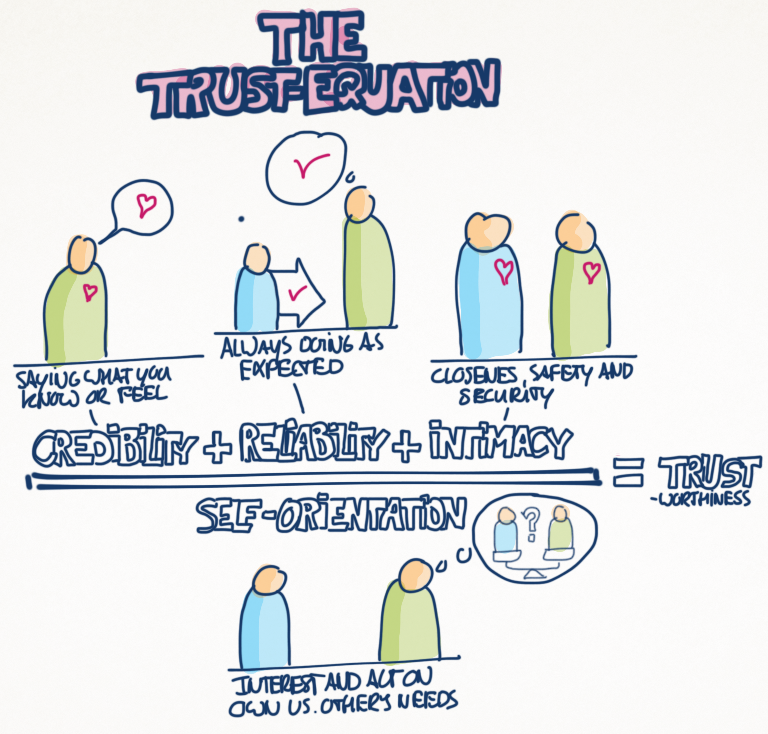 The trust-equation is described in the book by Maister, Green and Galford, called ‘The trusted advisor‘. Like the story of Sinek, it discusses the relatedness of trust and reliability, but adds the elements of credibility, intimacy and self-orientation. I’m not sure yet what the value of this equation is for me… It feels like something is missing, or that it is too simple. I guess I will have to come back on this one. Q: Dear reader, do you see any value/things missing in this equation? For me, trust is about faith. It’s something beyond mind (where credibility and reliability live), beyond true human interconnectedness (where intimacy lives). It’s about a connection and belief in something bigger and unknown, which lives as much inside of me (my foundation) as outside of me (the divine, or whatever we’d like to call it). And when I am aligned with it, I feel it deep inside; then I have faith in whatever choice or action I make. ‘Cause it’s based on love. I believe I at times can recognise it in others as well, and this feeling of deep deep admiration for them fills by soul. To me, this deep faith and belief is my definition of trust. “Don’t waste your life for that which is going to be taken away. Trust life. If you trust, only then can you drop your knowledge, only then can you put your mind aside. And with trust, something immense opens up. Then this life is no longer ordinary life, it becomes full of God, overflowing. When the heart is innocent and the walls have disappeared, you are bridged with infinity. And you are not deceived; there is nothing that can be taken away from you. That which can be taken away from you is not worth keeping, and that which cannot be taken away from you… why should one be afraid of its being taken away? It cannot be taken away, there is no possibility. You cannot lose your real treasure. Now is the moment to be a bungee jumper without the cord! And it is this quality of absolute trust, with no reservations or secret safety nets, that the Knight of Water demands from us. There is a tremendous sense of exhilaration if we can take the jump and move into the unknown, even if the idea scares us to death. And when we take trust to the level of the quantum leap, we don’t make any elaborate plans or preparations. We don’t say, “Okay, I trust that I know what to do now, and I’ll settle my things and pack my suitcase and take it with me.” No, we just jump, with hardly a thought for what happens next. The leap is the thing, and the thrill of it as we free-fall through the empty sky. Karin, thank you so much for your inspiring comment, it really got me thinking! I like that you mention that being aware of the unknown could be interesting. I realise that on my blog I’m simplifying things quite radically (or refer to people that have done so for me), but I’m going to try to write about this unknown stuff (ahum) some time. Thanks again! « The dubio-engine II – Accelerate your (self-) awareness!